Canaves Suites is a luxury resort located in the northwest tip of Santorini Island, in the extraordinary settlement of Oia. These cave suites were first built in 17th century. Carved into the rock, they have been elegantly designed and decorated according to the traditional style of Santorini island, furnished with antiques. The Canaves Suites staff offers guests excellent services and tasteful facilities, creating an environment of absolute sophistication. Canaves I Hotel in Santorini offers various types of apartments, spacious and elegantly designed overlooking the Caldera, aiming at satisfying all types of guests. All traditional houses are air-conditioned and are equipped with satellite TV, a mini bar, a fridge, a radio, a direct dial phone, a safe deposit box, a hair dryer, bathrobes, slippers and other comfort amenities. Junior Suite: The beautifully decorated junior suites offer a spacious living room, a cozy bedroom and a comfortable bathroom with shower or bathtub.The majestic Caldera view from the veranda promises a memorable vacation. The Junior Suite may accommodate up to three people. Superior Suite for 2 Persons: Superior Suites for two people feature grand spaces consisting of a bedroom and a spacious living room, while some of them include a loft.The private veranda offers a breathtaking view to the Caldera and the volcano. Bathrooms come with a Jacuzzi hydro jet shower or bathtub. The Superior Suites for 2 persons may accommodate up to three people. Superior Suite for 4 Persons: The main bedroom features en suite bathroom with Jacuzzi hydro jet shower or bathtub. There is also a second bedroom, with an extra bathroom situated near the spacious living room and the dining area. The veranda offers a wonderful view to the Caldera and the volcano. The Superior Suite for 4 persons can accommodate up to five people. Honeymoon Suite: Beautifully designed, the honeymoon suite is ideal for that special day. The suite features a bedroom, a separate living room and a bathroom with jacuzzi bathtub or hydro-massage jet shower. The veranda is ideal for romantic private moments, offering an open air Jacuzzi or an infinity pool and a splendid view to the Caldera and the volcano. 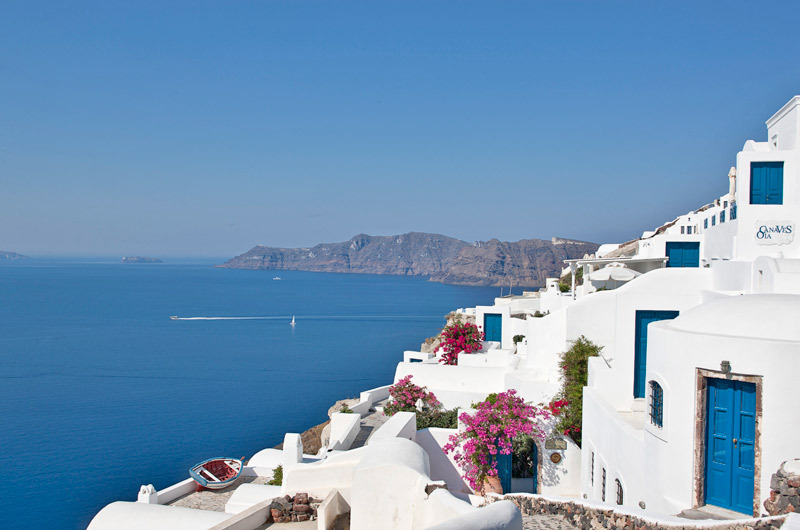 Canaves Suite: The Canaves Suite is the jewel of Canaves Oia Suites. Beautifully designed and decorated, it offers one main bedroom on a loft, with a bathroom featuring a bathtub and a hydro-massage jet shower. A second bedroom is located on the first level, with an extra bathroom near the spacious living room and the dining area. Sauna is available for moments of rejuvenation while the open air swimming pool at the veranda is ideal for relaxation with a fairytale view to the Caldera and the volcano. The Canaves Suite can accommodate up to five people. Canaves hotel does not have any children’‘s facilities and therefore does not accept children under the age of 13 years old for safety reasons.